"Do your prayers at times sound and feel the same? Have you ever said a prayer mechanically, the words pouring forth as though cut from a machine? Do you sometimes bore yourself as you pray? "Prayers that do not demand much of your thought will hardly merit much attention from our Heavenly Father. When you find yourself getting into a routine with your prayers, step back and think. Meditate for a while on the things for which you really are grateful. Look for them. They don't have to be grand or glorious. Sometimes we should express our gratitude for the small and simple things like the scent of the rain, the taste of your favorite macaroni and cheese recipe, or the sound of a loved one's voice. "Thinking of things we are grateful for is a healing balm. It helps us get outside ourselves. It changes our focus from our pains and our trials to the abundance of this beautiful world we live in." This is a profound insight: "Prayers that do not demand much of your thought will hardly merit much attention from our Heavenly Father." 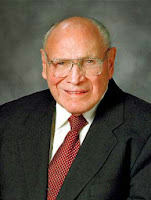 Our preparation for prayer, including the pondering Elder Wirthlin suggests, indicate how much we really value the communication. 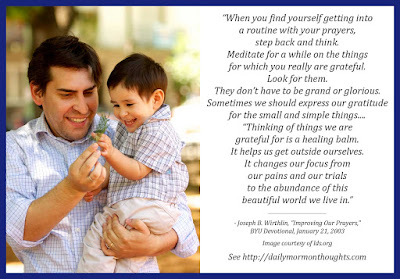 Before beginning prayer, we might "meditate for a while on the things for which you really are grateful" including the small and simple things. 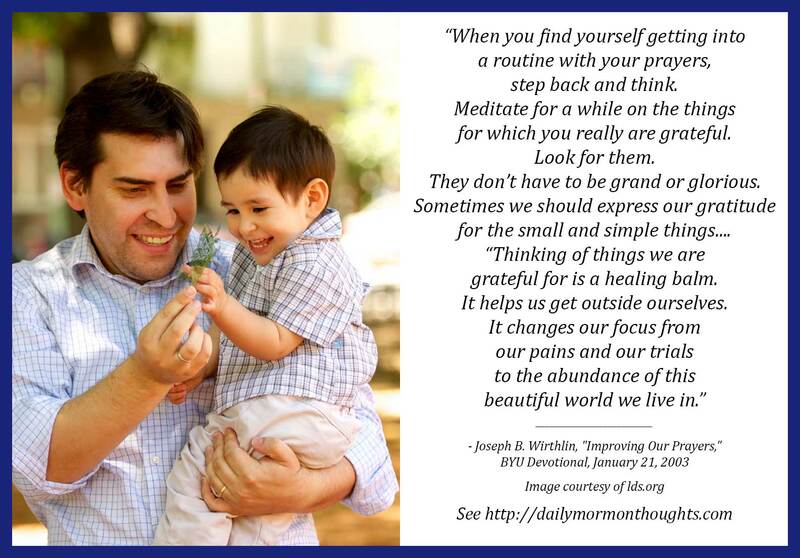 Not only does this meditation improve our prayers, but Elder Wirthlin suggests that it's also a healing act that helps us see the abundance of the world around us in spite of the inner challenges we might face. Labels: gratitude, healing, prayer, Wirthlin Joseph B.